Leo Fall was born at Olomouc, in Moravia, into a family of musicians. His father was not only a military bandmaster but also composed several marches and an operetta. Fall had two younger brothers who also became professional musicians. Leo Fall went to the Vienna Conservatory, and on completing his studies he moved to Berlin and took up various conducting positions. 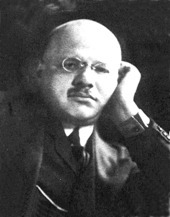 He also turned to composition but his first operetta, Der Rebell (1905), although given its first performance at the Theater an der Wien, was not a success. Undeterred, however, he continued composing and a string of operetta successes soon followed. For example, Der fidele Bauer (The Merry Peasant, 1907); Die Dollarprinzessin (The Dollar Princess, 1907); Die geschiedene Frau (The Divorcée, 1908); Der liebe Augustin (Dear Augustin, 1912); Die Rose von Stambul (The Rose of Stamboul, 1916); and Madame Pompadour (1922). Although Fall wrote 3 operas, it is for his operettas (22) that he is remembered today. He died from cancer in 1925 at the early age of 52. He was at the height of his powers and was gaining wide recognition for writing operettas which had the gaiety and sparkle of the French, in addition to containing sensational waltzes in true Viennese style. His operettas have regained fashion and are currently being staged in Austria and Germany. Leo Fall is the subject of a biography by Stefan Frey (2010).